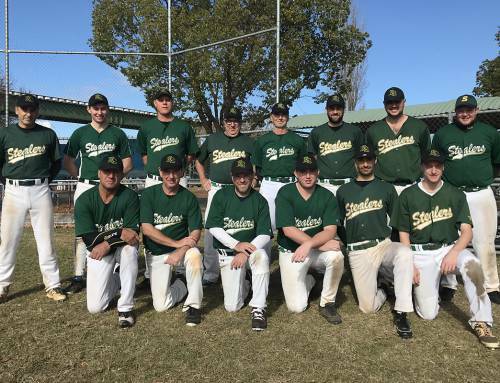 The Ku-ring-gai Stealers took home an 8-7 victory over the second place ThornLeigh team in a five innings cliff hanger at Cliff Oval on Saturday. The game was decided on the last play of the game when the Aryia Iwato scored the winning run at the bottom of the fifth inning. ThornLeigh jumped out to an early 5-0 lead in the top of the third. Dave Van Coller singled to ignite ThornLeigh’s offense. A stolen base then moved Dave from first to second. Nick Gordonsingled, scoring Dave. The scoreboard lit up again for ThornLeigh when Mellow and Gordon scored on a three-run home run by Lucas Jonesand Fogg scored on an RBI double by Faham Hussian. The Stealers stayed close with the help of Aaron Duckworth, who went 2 for 2 – he singled in the second and fourth innings and Aryia Iwato also helped the Stealers scoring two runs on an RBI single. In the fourth Inning, a single by Eogar Walloin gave ThornLeigh life, but the Stealers stopped the rally after Gene Reis got Henry Mellow to strike out. Stealers answered ThornLeigh with five runs of its own in the fourth. Stealers scored on an RBI single by Aaron, a steal of home by Kim Timmins, an RBI triple by Gene, and an RBI single by Aryia. Stealers Manager David Lane said after the game: “The game showed the real character of the team, we stay close during the game due to good pitching and defence and then we were able to generate enough offence to win. – we never gave-up. That is the character of the team. A good win”.